Here is a sketch from a staircase from the Barbican Podium, just outside the Dentists but just inside the old London Wall. Parts of the Roman London Wall are in the foreground, 2nd century AD. St Giles’ has Roman foundations and is much rebuilt. The church we see now is the 1966 restoration following designs of architect Godfrey Allen (1891-1986). He used historic plans to make the church as much as possible like the medeival original. It had been burned by incendiary bombs in 1940. In the background is Shakespeare Tower, Barbican, completed 1976, to the designs of Chamberlain, Powell and Bonn. St Giles’ Church is “St Giles’-without-Cripplegate”. As you can see from the picture, the Church is outside London Wall. Here is an extract from the St Giles’ website. The foundations are generally Roman but higher up, the structure dates from various times as it was regularly strengthened and rebuilt…. As the population of the parish increased, the church was enlarged and it was rebuilt in the Perpendicular Gothic style in 1394, during the reign of Richard II. The stone tower was added in 1682. The church was damaged by fire on three occasions – in 1545, 1897 and 1940…The church was designated a Grade I listed building on 4 January 1950 and it was extensively restored in 1966. The bombing of Cripplegate in 1940 was so extensive that barely any buildings remained standing in the entire ward. By 1951, only 48 people were registered as living within the ward. It was this widespread devastation which led to planners envisaging and eventually building the modern Barbican estate and arts centre, starting in 1965. 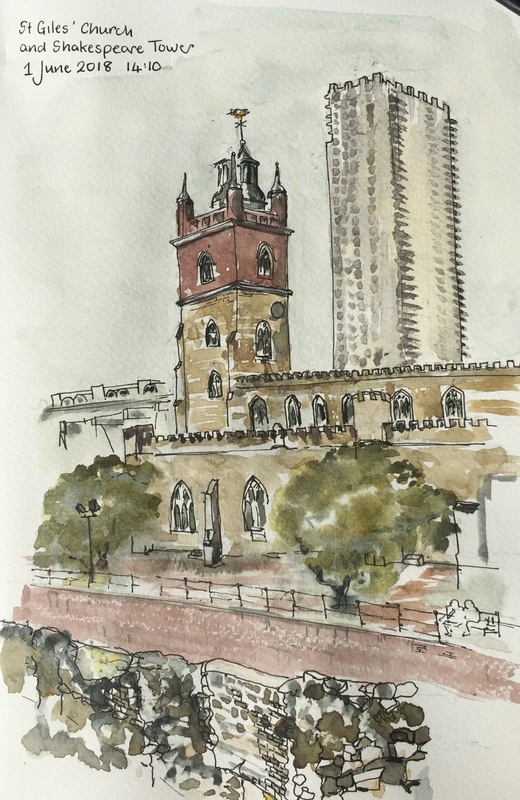 As I was drawing, I saw that the crenellations on St Giles were echoed high up on Shakespeare Tower. The drawing took two hours, pen and wash, in a Jackson’s Watercolour Sketchbook. 7 inches by 10 inches.